Here's something as synonymous with December as Christmas trees, lights and sweets: Diamonds. Yes, all those cliches about wanting "Santa Baby" to bring you a ring (or other bling) are backed up by the data. 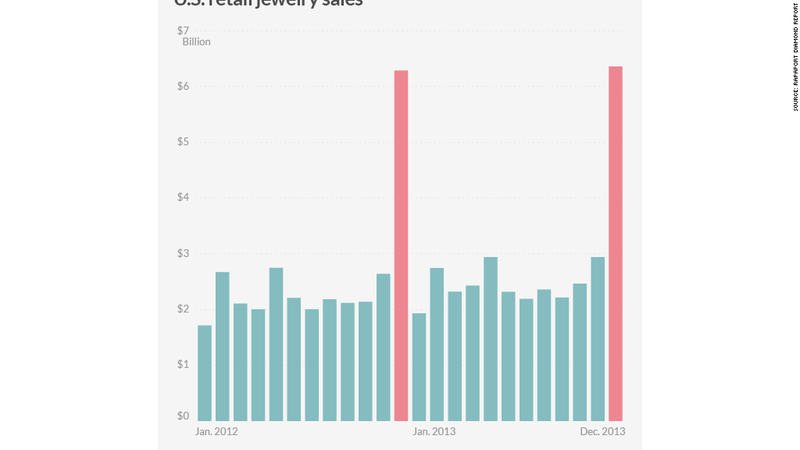 Americans spend over $6 billion on jewelery in the final month of the year. There's something about Hanukkah and Christmas that necessitates jewels, even more so than Valentine's Day or summer wedding season. "These are the two most important weeks of the year for jewelers. This is it," says Martin Rapaport, chair of the Rapaport Group. He's worked in the diamond industry since the 1970s. About 20% of all retail jewelry and diamond sales occur in the month of December, according to the Rapaport Diamond Report. December tops every other month by far, and it's been that way for years. "The guy knows he has to give something to his wife. What's he going to give her? A refridgerator? An iPad or iPhone?" notes Raport. "A diamond connotes commitment." Like much of the retail sector, this is make or break time for the year. All the signs are pointing to a sparkly end to 2014. 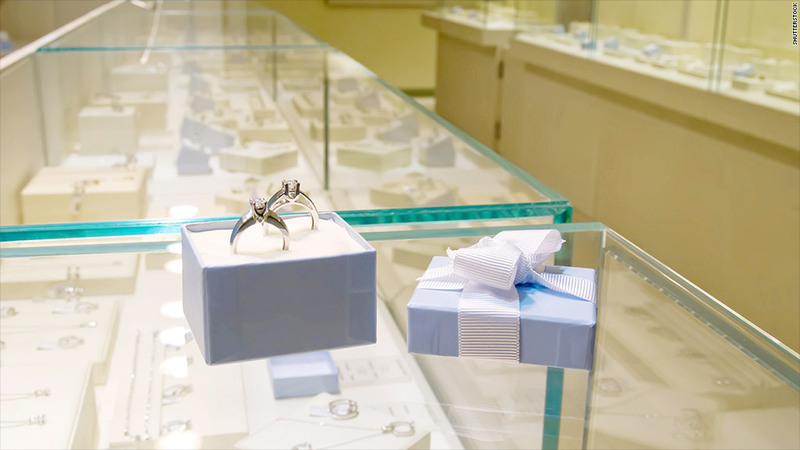 Both Tiffany (TIF) and Signet (SIG), which owns Jared, Kay and Zales, have reported strong sales, especially in the United States. Related: Is Tiffany stock better than diamonds? Anyone headed to the store should take heart. It's not a bad time to buy. Diamond prices are down slightly this year -- about 8% for the 1-carat that is the industry's bedrock. But there's one part of the market that isn't showing any weakness: Higher-end jewelry (think 3 carat or above diamonds). It's easy to understand as wealth rises around the world and another good year for the stock market wraps up. People want luxury items. Emerging markets are also playing a bigger role. The closest holiday to Christmas in the diamond industry is fast becoming Chinese New Year in February.